In November 2013, Sheryl Sandberg, Chief Operating Officer (COO) of Facebook, was interviewed on stage at the Dreamforce conference a company called Salesforce hosted for its current and potential clients. Sandberg was promoting her new book but she was also promoting the notion that the American workforce is missing out on the value of women by forcing so many of them to choose between career and motherhood. Sandberg wants more baby talk on the job without the threat of discrimination, lawsuits, and diminished opportunity. Of the chief executive officers (CEOs) on the Fortune 500 list, only 4.2 percent of them are women. In the business magazine’s top 1,000 list, only 4.5 percent of CEOs are women. Sandberg identifies a number of reasons why women run so few leading companies in her book, Lean In, in which she encourages women to lean in and claim the opportunities they are perfectly qualified to claim. Sandberg is the married mother of two, a graduate of Harvard Business School, was once Chief of Staff for the US Secretary of the Treasury, a previous Vice President of Global Online Sales and Operations for Google, and is now Chief Operating Officer (COO) for Facebook. Time magazine named her to its Time 100 list of most influential people in the world in 2012. She was being interviewed by Marc Benioff, Chairman and CEO of Salesforce.com, inc., a cloud computing company with global reach. It creates, sells, and helps businesses run customer relationship management tools that help companies keep projects and budgets on track and pinpoints the most opportune moment for a company’s sales force to land a sale. Forbes magazine says Salesforce.com is currently the most innovative company in America and places it in the #7 slot of it’s “100 Best Companies to Work For in 2014” list. Sandberg describes her ultimate goal as true equality between men and women. “A truly equal world would be one where women ran half our countries and companies and men ran half our homes,” she said. Source: Bort, Julie. 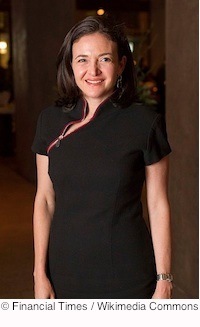 “Sheryl Sandberg Wants Every Boss To Talk About Pregnancy.” Business Insider. Nov 23, 2013. Web. Jan 30, 2014.